Gently removes all eye make up, including long lasting and waterproof make up. No oily residue. Suitable for sensitive eyes and contact lens wearers. Dermatologically and Ophthalmologically tested. Pour a generous amount on the cotton ball or cotton pad. Wipe gently on eye lids and eye lashes to remove eye make up. Wipe gently on lips to remove lipsticks and lipglosses. I like to wipe and lightly exfoliate my lips. Lipsticks sometimes sink to my dead skin on my lips. So with a cotton pad, I lightly remove dead skin all in one step. $7.99 at Shoppers Drug Mart. When this item goes on sale, it can get as low as $5.95. The lowest I saw was $3.95 on Amazon.com. You can easily find this a Well.ca, Ulta, Walgreens, Walmart, Rexall, Zellers, Target, CVS and Kmart. I bought this item on a sale so I bought two bottles (both different packaging) because I was desperate for oil-free eye make up remover and because I was definitely on a budget. Usually I remove all my make up with a cleansing oil without any prior make up removers (one-step to take off make up, then cleansing milk/cleanser). However, I noticed I was using up my cleansing oil way too quickly. Moreover, the cleansing oils I've been using are a little costly (Fancl, Bobbi Brown), so I wanted to use less cleansing oil by doing some makeup removing before I start the cleansing oil step. Lastly, another reason was because I didnt want to have lipglosses, lipsticks and eyeshadows all mixed together on my face when I clean with cleansing oil. 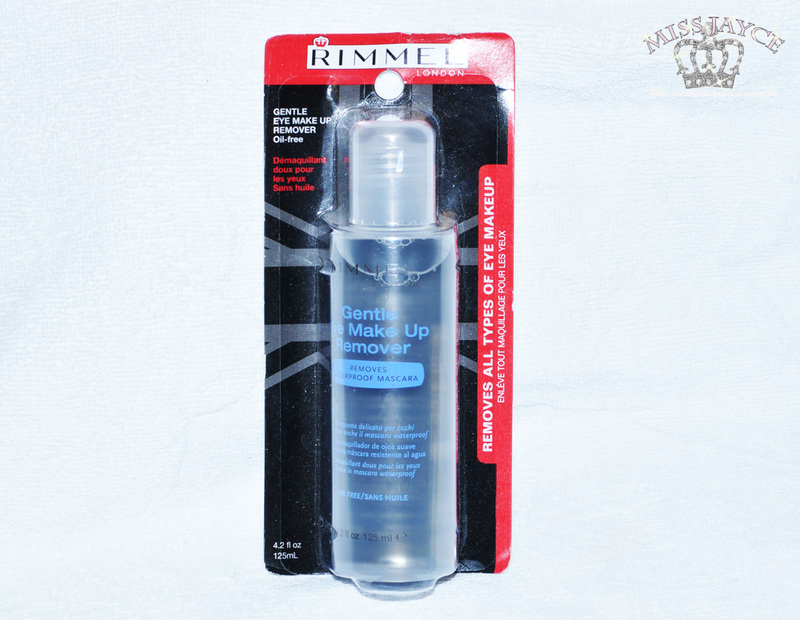 I've been using the Rimmel Gentle Eye Make Up Remover for 2 weeks now and I find it very gentle. So gentle that it DOES NOT remove any waterproof make up. It also stings my eyes and then my eyes begins to water up. But hey, at least it is absolutely oil-free and leaves zero oil residue like other removers on the market. This is what I do: I like to moisten my cotton pad, give it 3 seconds on my closed eye, then gently wipe it all away. Same process for lips. It does a fabulous job at removing eyeshadows and lipsticks/lipglosses. It didn't do a good job at removing non-waterproof mascara leaving residue on my eye bag area and it certainly did a poor job with waterproof mascara. Not a trace of mascara was removed. I do not recommend this eye make up remover. However, I am left with 1 bottle and a half bottle. So what do I use it for now? I strictly use it to remove lip products off and for removing swatches. As a blogger, I'm sure you can easily relate to this, we love swatching everything! This remover is excellent because I don't feel like I'm wasting remover when I excessively use it to clean up swatches for eyeshadows and lipsticks/lipglosses. The price makes me guilt-free! Product: 3.5/5 ♥ I don't think it matches its claims. I was greatly disappointed that it did not remove mascaras (both waterproof and non waterproof). Also, I don't think it's good for sensitive eyes considering my eyes began to water up. It did do an amazing job removing normal eyeshadows and lip products though. Packaging: 5/5 ♥ Simple and it has a small opening unlike L'Oreal, Lancome or Estee Lauder's big opening. I can easily control the amount of product being used without spilling. Price: 5/5 ♥ When compared to Lancome and Estee Lauder, I think the price is very reasonable and affordable.